When the time comes to replace your clawfoot bathtub faucet, you have many options. According to The Facts On Faucets, an article featured in This Old House, a good idea is to replace the old faucet with one of a similar style. This means, if you have a faucet that mounts to the bathtub wall as opposed to the rim or bathroom wall, that style bathtub faucet should be your first choice. Another factor to consider when replacing a clawfoot bathtub faucet is the size of the drillings. Drillings are holes drilled into the tub by the manufacturer. The number of drilled holes can vary, as well as the distance between the holes. If the measurement results aren't standard and you have a unique distance between the drillings, you will want to purchase a faucet with adjustable faucet centers. Installation instructions are included when you purchase a new clawfoot bathtub faucet. However, enlisting the help of a plumber is recommended on most installations to ensure the product warranty is valid. These installation instructions are an example specifically created for a Randolph Morris Wall Mount Tub Faucet Set. Depending on the type of clawfoot tub faucet you choose, the installation instructions will vary. 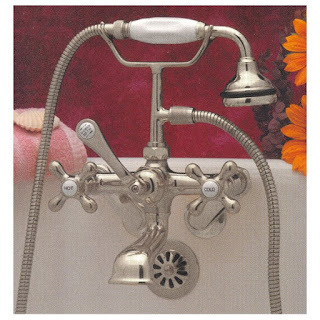 You can view the installation instructions for bathtub faucets purchased from Vintage Tub & Bath online below the Specifications section at the bottom of each product page. For help choosing the best clawfoot tub faucet for your needs, visit our Tub Faucet Buying Guide. Luckily for those who do not know much about repairing simple household problems, we have blogs such as this to assist us so that we do not have to solely rely on repairmen for everything that goes wrong in the house. It would be helpful if we know a thing or two about home improvement and repairs so that we will be given an idea on how things work around our residence aside from just using them.